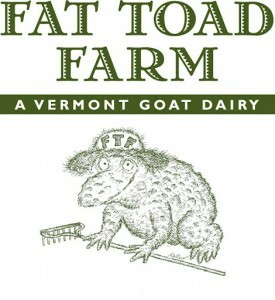 You’ll find Fat Toad Farm down a beautiful, winding, sometimes snowy, sometimes really muddy, dirt road carving through the hills of Central Vermont. We started out hand milking a lovely French Alpine doe named Jupiter in our garage, and seven years later we are milking Jupiter’s great, great, great, granddaughter Artemis and fifty-two of her closest caprine friends in a modern parlor. Fat Toad Farm is run by husband and wife team Steve Reid and Judith Irving, their daughters Calley Hastings and Hannah Reid, and two perfectly invaluable employees Katie Sullivan & Christine Porcaro. The family has spent the last seven years building a high-quality herd of Alpine milking goats and perfecting the art of caramel making. They are currently milking 54 goats every day, twice a day, and use the fresh, sweet milk to make their unique goat’s milk caramel sauces. Fat Toad Farm’s goat’s milk caramel sauces (the traditional Mexican confection known as Cajeta) is the happy result of combining a small number of fresh, simple, natural ingredients and a lot of love (and stirring). From the grazing and milking to the stirring, bottling, labeling, marketing, and shipping, it all happens right here on the farm in true farmstead fashion. Over the years the Fat Toad Farm family has stayed true to its mission of working together as a team in close connection with our land and animals to make a high quality artisanal product.